Much of the media coverage of the continuing government shutdown has focused on stories of federal workers who aren’t getting paid. Stories about irregular inspections of our food and longer, slower lines at airports. But some things we enjoy — workers in the private and federal sectors alike — and things that make our lives better are affected, too. Things such as zoos, museums, and national parks. The shutdown is affecting craft brewers, of which North Carolina has many. The shutdown, as the Associated Press reported, has put a hold on new releases, prevented new breweries from opening, and stopped shipments of some beer across state lines. The partial shutdown halted operations at the federal agency that regulates alcohol production and distribution, the AP says, meaning government employees can’t issue the necessary permits. The shutdown, which began Dec. 22, hurts craft brewers who offer wider varieties of beer and seasonal selections — in smaller batches. The biggest brewers are largely unaffected because they already have government approval for their top national brands. “I’ve been joking with people that if you’re going to want a new beer coming out pretty soon, you’re going to have to drink your brother-in-law’s home brew,” said Russ Klisch, founder and president of Lakefront Brewery in Milwaukee, told the AP. At Lakefront, the release of a new beer has been postponed because the Alcohol and Tobacco Tax and Trade Bureau is not open to approve labels for the bottles and cans. The brewery can sell beer in Wisconsin, but sales in other states require federally approved labels. The TTB holds holds federal regulatory control, including tax oversight, over alcohol and tobacco. The bureau, while still performing some functions, is effectively closed. It is, however, accepting payments and returns for excise taxes. This week, The Hill reported, a Washington, D.C., brewery sued the acting U.S. attorney general over its inability to sell labeled beer during the shutdown. In the lawsuit, the brewer, Atlas Brew Works, argues the shutdown has affected its ability to sell labeled beer, and this represents a violation of the First Amendment. We’re not taking sides or assigning blame. But, the reality is, the government is heavily invested in regulating alcohol, and the details of the rules, codes, and laws are, at best, intricate. At worst, they’re twisted and convoluted. North Carolina has some 300 breweries and brew pubs, the N.C. Craft Brewers Guild says. So far, the state’s brewers have so far rumbled just a little about the consequences of the federal shutdown. Expect them to get louder as the shutdown drags on. 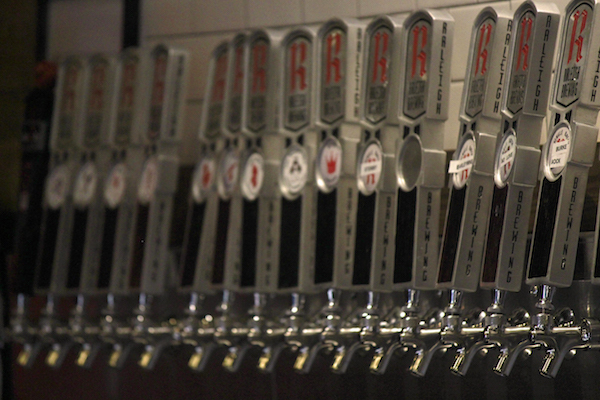 “Anybody distributing beers outside North Carolina is going to be affected,” says Kristie Nystedt, president and CEO of Raleigh Brewing Co.
Nystedt’s company, she says, is — and has been — dealing with crushing tariffs on steel.